This exhibition has around 160 works by 15 artists, is open until March, and adults can get through the door for $10 and pensioners and students for $8. There is cheap parking underneath. There is a website with activities and there is a book of the exhibition. The exhibition is certainly worth a visit though the quality ranges considerably; some works leap out at the viewer like a Labrador puppy; others are just pictures of dogs. There are other animals as well, but this reviewer is a dog person. Among the best works, some of Darren McDonald’s large and simple canvasses, notably ‘Daniel and Chopper’, have a touch of Arthur Boyd to them. McDonald’s dogs have character sufficient to impress the curator, one large bull terrier especially: ‘Scone may be a lump of a dog but he has great presence’. Mick, another dog, came back after a bushfire; bit of a story there, too, you’d think. The anthropologist, Dr Jane Goodall, and a (presumably domesticated) dingo look pleased with each other’s company in another Darren McDonald portrait. McDonald does cats, too. Robyn Sweaney has some small, almost photographic paintings of dogs and her Mrs Violet Frisby, complete with lorikeets, looks ready to step into an ‘Australian Story’ episode. Lorikeets only settle on characters, in my experience. Sweaney’s ‘Sunday afternoon’ has two inquisitive dogs, four talkative senior cits, and a house straight from the 1960s. Janet Dawson’s ‘Summer 1986’ stars (the late now but then thriving) Michael Boddy’s private parts, nestling as in a bird’s nest in centre canvas. Lulu the kelpie, bottom left, almost seems superfluous but must be in the picture for a reason. Subject and artist clearly knew each other well (by dint of being soulmates); Lulu must have known them both. By contrast, William Robinson’s ‘Self-portrait for Town & Country’ includes two pugs who seemed to have wandered into the scene by accident. They fill a corner of the main painting and pop up again in the painting within the painting but otherwise seem hapless. 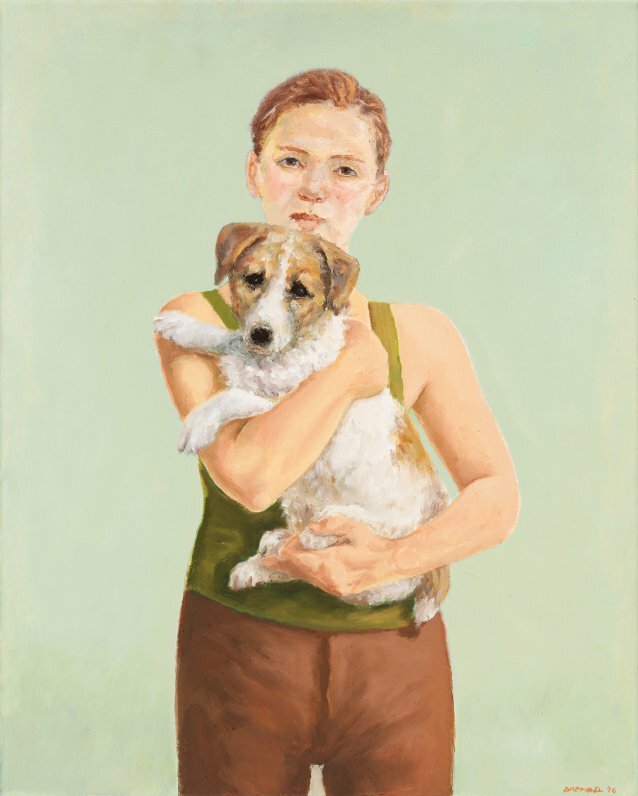 Besides the dingo, there are few non-domestic animals in the exhibition but it is supposed to be about pets, after all. Still, lots of farms have pet kangaroos; a woman of my ken was once bailed up by an old man kangaroo while she was on her way to the outside dunny. In this collection, Davida Allen’s ‘Kangaroos’ is messy and lacks a focus or any hint of threat, with the kangaroos in the middle distance, well away from dunnies. Jude Rae’s ‘Self-portrait (the year my husband left)’ is arresting and not just for the title. The artist stares straight at the world as if to say, ‘Bugger him and bugger you’. The dog in the corner, by contrast, looks bereft, clearly missing the bloke around the house. Then there are the cats, less of them but still present. Noel McKenna‘s small cat (and dog) portraits would be talking points hung on a wall down a flight of stairs. (I know just the place.) The same artist’s much larger ‘Quiet room’ (man and dog with furniture) reminded me of the work of James Thurber, a lugubrious author, who also drew thoughtful dogs better than anyone (and that is not said just because our family includes a Thurberian dog). Lucy Culliton has a lot of pictures on display and not all of them come off for me, though they do include horses and sheep, which is a change from dogs and cats. Culliton’s ‘Self with friends’ has some Merino rams of formidable mien but her other sheep look, well, sheepish. Her small cat, ‘Emitt sitting’, on the other hand, is all that a cat should be, compact, composed, condescending. There are two significant sets of large portraits of people with their pets and one set works better than the other. Nicholas Hastings’ 15 or so fairly well-known people (Canberra real estate man, Peter Blackshaw, Genevieve Lemon, Anna Volska, Charles Waterstreet, Hugo Weaving, and others) with their dogs, cats, or parrots, has pets as props. Most of Hastings’s paintings are dull. Graeme Dreindel, on the other hand, has animals with people (mostly less well-known people) and his pets and animals seem to be relating to each other. Try his ‘Ministrations of the shepherdess’ and ‘Billie’, the latter rightly featured on the cover of the exhibition book (and above). There is lots more and the show is certainly worth a visit; this smaller national cultural institution is not as well-patronised as it should be, so please make up for this. Perhaps my favourite painting was from Kristin Headlam, a work 2 metres wide by 0.8 metres tall, the artist to the far left, painting on a canvas that we cannot see, her partner, Chris Wallace-Crabbe, to the far right making tea, Pamphlet the dog on the couch, looking contented; in between, the paraphernalia of a lived-in house – books, paintings, mess. This dog is clearly part of the family and you want to make the acquaintance of all three. Finally, there are photographs by Mark Mohell of each artist and there were one or two surprises for me: who would have thought a painting like that could have been produced by a person who looks like that? But then art, as we know, comes from inside. Out the door of the Portrait Gallery, turn right and across the slowly browning lawns of Canberra, there is The Sell, the National Library’s exhibition of advertisements from the 1790s to the 1990s. It does indeed achieve that spread, with a 1796 handbill for a theatre production in the infant colony, through to Condoman and John Howard in more-or-less the 1990s, though the great bulk of the exhibits seem to be twentieth century up to around the 1960s, tailing off with television. The exhibition is free and runs till April. The exhibits are mostly from newspapers, magazines, and billboards, rather than from screens or wireless. An awful lot are for food and drink (biscuits, tea, Minties, Vegemite), clothing (Akubra hats, Stamina trousers), travel (remember TAA? ), cleaning products, and cigarettes (the Capstan Test Cricket Calendar for 1949, featuring Don Bradman, and a Winfield ad from about the 1970s, starring Paul Hogan, a rolled-gold phoney and FAQ comedian of the era who looks different today and not just because he is older). Even the static version of the AntzPantz commercial will set some pulses racing (did she say, ‘Sic ‘em Rex’ or ‘Get ‘em, Rex’ in the TV version?) but there is also a plug for appropriate body images and exercise, too, including ‘Life. Be in it’. For this ex-Melburnian, one of the most arresting exhibits, though, was the series of photographs of Victorian Railways advertising, on stations and billboards, many of them produced by the ace signwriters employed by the notable firm, AC Mence. These tradesmen-artists left a poignant legacy, in photographs at least. The architecture of many Melbourne railway stations (not ‘train stations’ in those days) seemed to remain static from around Federation to the 1950s and Mence signs were intrinsic to it. Those pictures evoked memories of a train-travelling childhood more effectively than that infernal Aeroplane jelly song did of desserts. Indeed, I can never recall hearing that song as a youngster; our family certainly never ate jelly of that brand. Maybe it was a New South Wales thing. Advertisements have been around in Australia almost as long as white settlers have been here and they are presented in an exhibition of items which, ironically enough, are classified as ‘ephemera’. It is good that we have places like the National Library which collect ephemera – and long may they continue to have the resources to do so. Well done to the curators and technical people at both the Portrait Gallery (curator Sarah Engledow) and the Library (curator Susannah Helman). * Vance Gainsborough is a long-time resident of Canberra. He has dabbled in oils, producing some forgettable paintings, and consumed advertised legal products and services all his life. The handle is a pseudonym.